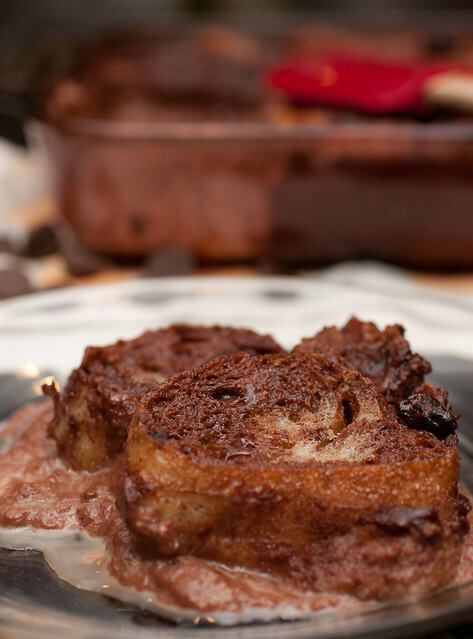 This chocolate bread pudding capitalizes on a heavenly mixture of cream, chocolate, spices, and Grand Marnier. 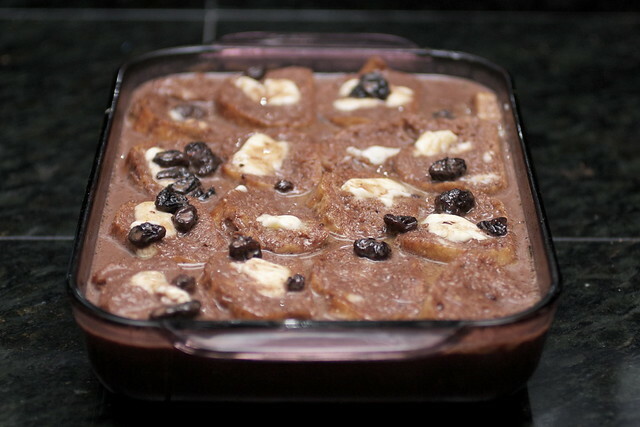 It was the first time I’d ever made a bread pudding, and I have to admit that I didn’t make it perfectly. I used a baguette, so my bread slices were too small. I left the crusts on, which was okay, but there’s almost as much crust as bread. My slices weren’t overlapping or submerged enough, so they floated to the top as the pudding cooked underneath. 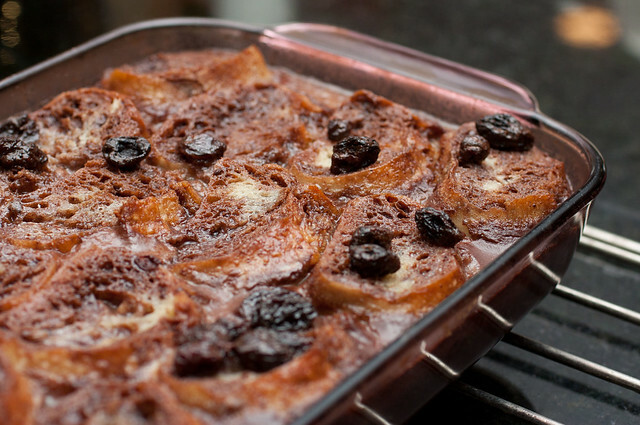 But it doesn’t matter, because the taste of this chocolate bread pudding is exquisit. The bread is melty, the chocolate is creamy, and the pudding isn’t overwhelmingly sweet. Rather, it’s decadent. A delicious mistake. And hopefully yours will be equally delicious, minus the small errors. I’ve made a few changes in the recipe below, but if you follow it as written, yours should be okay. Lightly grease a 7 x 11 inch baking dish. Using a double boiler (a heat-safe bowl over a small saucepan with boiling water), melt the chocolate over low heat, stirring frequently until just melted. Immediately remove from the heat. 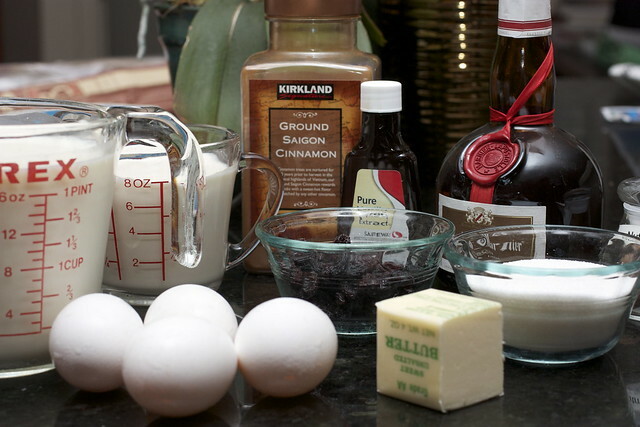 In a medium bowl using a fork, beat together the eggs, nutmeg, cinnamon, and vanilla until well blended. Beat about 1 cup of the chocolate mixture into the egg mixture. Then, add the egg mixture to the chocolate mixture, stirring until well blended. Slowly pour the chocolate mixture over the bread. 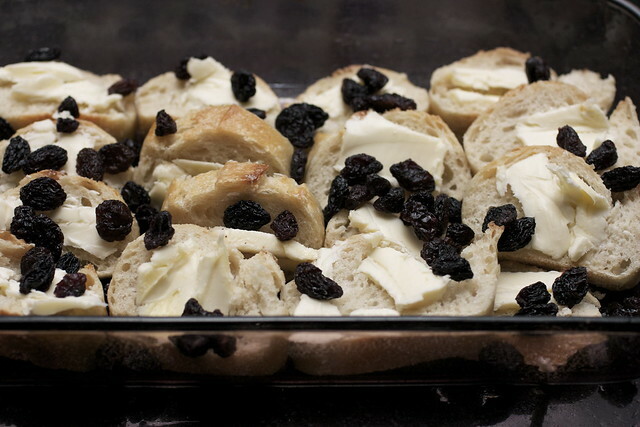 Lay a large sheet of baking parchment or wax paper over the top and press down to keep the bread submerged. Let the pudding stand for 15 minute. Meanwhile, position a rack in the middle of the oven and preheat to 350 degrees F. Remove the parchment paper. Carefully set the dish into a slightly larger roasting pan. Place on the oven rack. Add 3/4 inch hot water to the pan. Bake for 30 minutes. Lower the oven temperature to 325 degrees F. Bake until the pudding puffs slightly and the center feels set when lightly tapped, 10-12 minutes more. Transfer to a wire rack and let cool for at least 15 minutes. Before serving, lightly dust powdered sugar over the pudding. The pudding will keep, covered, in the refrigerator for up to 3 days. Reheat before serving. Mistake. I read this recipe at 2 a.m., in bed when I couldn’t sleep. Now, I still can’t sleep AND I’m starving! I always fall into that trap! Except I usually can’t control myself, so I hop out of bed to make something.